Book Description :Willi Unsoeld became an international hero during the Kennedy years, when he emerged as probably the greatest American climber of the Himalayan golden age. Displaying the sort of vigor that President Kennedy so admired, Unsoeld became the most visible hero of an ascent of Everest's previously-unclimbed West Ridge -- an ascent that cost him parts of both feet and nearly his life. His casual fearlessness and physical power established the template for extreme adventure, and his lectures as a charismatic professor inspired the generation of the sixties to test itself in acts of physical daring. 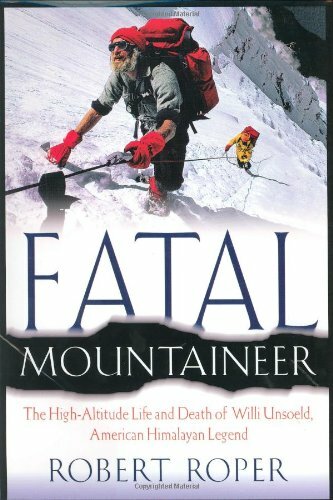 Fatal Mountaineer sets Willi Unsoeld's intense life against the story of two defining adventures: the triumph on Everest and a more ill-starred expedition in 1976, when he led a group of mountaineers up a new route on Nanda Devi, the tallest peak in India. One of that gifted group of climbers was Willi's daughter, Devi -- a golden girl named for the mountain she sought to ascend with her beloved father. The intense rivalries within the expedition team, and the dangers of the route, led to an outcome darkened by tragedy, an outcome that continues to fuel one of the most tormenting debates in mountaineering history. Blending adventure with a frank look at the cultural background, Fatal Mountaineer considers the pressures on mountaineers in a period of our history torn by conflict. It balances hunger for fame with stark tragedy, a man's ambition with a father's love. Unsoeld emerges as an American classic, a self-invented genius of adventure to rank with Mark Twain or Will Rogers for sheer attractiveness. Under the close scrutiny of this thrilling story, his heroism turns out to be deeply authentic-as does his suffering. About the Author :Robert Roper is the author of numerous novels and story collections including Cuervo Tales, The Trespassers, and In Caverns of Blue Ice. He contributes regularly to Men's Journal and has also written for Outside, National Geographic Adventure, The New York Times, the Los Angeles Times, and many other papers and magazines. His awards include grants from the NEA and the Ingram Merrill Foundation. A climber, he reports often on adventure subjects and in recent years has also written on retrovirology, financial derivatives, nuclear non-proliferation, and World War II partisan warfare. He teaches writing and film at universities in California, where he lives.